Moon Shell Beach by Nancy Thayer and Beautiful Ruins by Jess Walter We’ll start the bag packing with two that are more in tune with beachy reads. Both have been recommended by friends and I’ve yet to get to them. The Light Between Oceans by M.L. Stedman and The Orphan Master’s Son by Adam Johnson. These two heavier books are picks from my June book group lists. I have about three weeks for both, so I better get started! Re Jane: A Novel by Patricia Park and How To Start A Fire by Lisa Lutz. I am trying to balance new releases with backlist books and these two May 2015 releases have piqued my curiosity. Memory Wall by Anthony Doerr and Cranky Ladies of History by Various Authors. My beach bag wouldn’t be complete without short stories. I absolutely loved Doerr’s The Shell Collector and it was a perfect beach read on my last vacay. Cranky Ladies of History just sounds fantastic and entertaining following 22 ladies who “have had good reason to be cranky”. To Kill A Mockingbird by Harper Lee and And Then There Were None by Agatha Christie. I wanted to pick two classics and I am going to read Mockingbird without a doubt this summer before Go Set A Watchman is released. I’ve been talking about finally reading a Christie book for years now and it’s time to make it happen this summer. Mystery and suspense novels poolside or on a beach can be dangerous because once they get their hooks in you, sunscreen may be forgotten. What is going in your beach bag this summer? 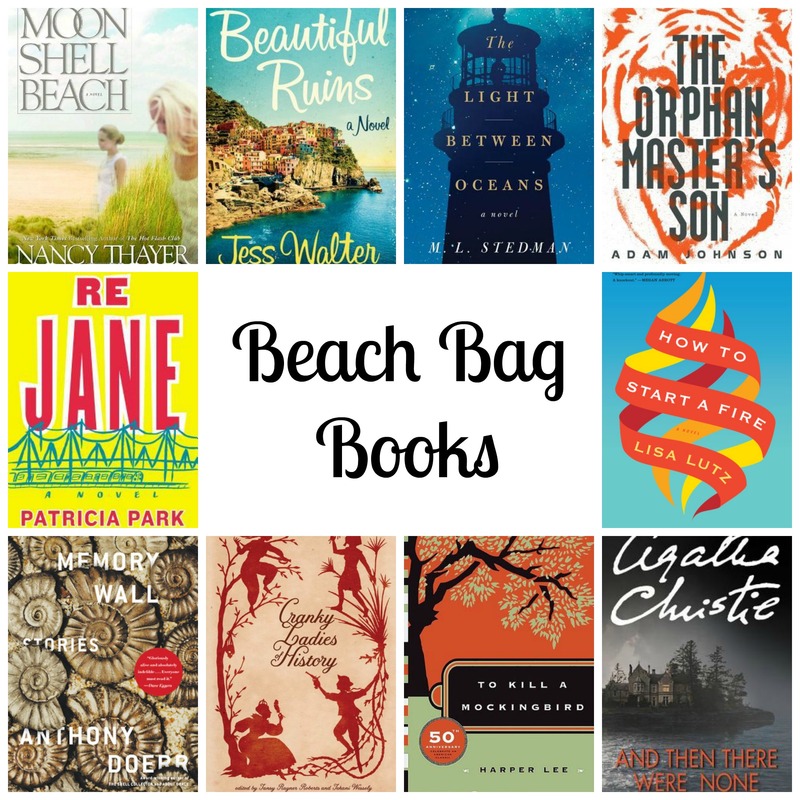 Tags: beach bag books, beach books, Classics, new releases, short stories, top ten tuesday. Bookmark the permalink. Previous post ← A Debut and a Final Work You Don’t Want to Miss This Month. TKAM is happening for me in the near future as well! I read The Light Between Oceans for my book club last year, and it sparked some interesting discussions, so I can’t wait to hear what you think. I’m super excited to reread TKAM. I first read it as a tween so I wonder how it will be a second time as an adult. The Light is going to be a movie with Michael Fassbender this year, whom I LOVE. I’ve heard good things about How to Start A Fire! And – wow – The Orphan Master’s Son as a beach read…I read that one a few yrs ago and I wasn’t really a fan, but it won some awards, so maybe you’ll have better luck. And – I’m planning to re-read TKAM soon too (actually, right after I finish my current book)! I’ve also heard good things about HtSaF also. And I have some reservations about Orphan Master’s Son. It’s a library group that I host and so far this year the picks have not been my cup of tea, except maybe two. I just put How to Start a Fire on hold at the library yesterday, so it looks like it will end up being a beachy read for me, too. And I’m definitely planning a re- read of TKAM, too! And Then There Were None has been on my list for a while. I’ve only read one Agatha Christie and I enjoyed it quite a bit even though mysteries are not really my thing. My turn is up next to pick for my book club and it’s gonna be that one or The Storied Life of AJ Fikry. Hope you get to the beach!! Great book group picks! I hope I get to the beach also!! Haha! Short stories are a hard sell too! Re Jane and How To Start A Fire are both on my summer reading list too. I like your eclectic list, better than the same old, same old. Thanks! I just saw How To Start A Fire come in at the library but I’m a few down on the holds list.